The Sonoran Desert Florilegium Program is working with educators and scientists on projects that utilize botanical illustrations, with the ultimate goal of increasing the awareness of the need for these illustrations as an aid to conserve and protect the flora of the Sonoran Desert. The Sonoran Desert Florilegium Program is working with the University of Arizona Campus Arboretum and botanical artists to establish the Florilegium of the Joseph Wood Krutch Garden. This traditional Florilegium will be a physical collection of art purchased by the Arboretum, accessioned, and permanently stored in Special Collections at the U of A Library. Special Collections will periodically exhibit the artwork at various venues on campus, and the collection will be available for loan for off-campus exhibits. The Campus Arboretum is responsible for raising funds to purchase the artwork, and the Sonoran Desert Florilegium Program will help recruit artists and assist the Campus Arboretum with fundraising efforts. The University’s cactus collection consisted of over 600 species was in the late 1890s. Over time it has varied in size and location. By 1980, what had become an island of desert plants surrounded by grass, was dedicated to Joseph Wood Krutch (whose personal papers are held by the U of A Library). Over the years new species were added to the garden, and in 2004 it became part of the Alumni Plaza and was enlarged and planted with additional Sonoran Desert species. 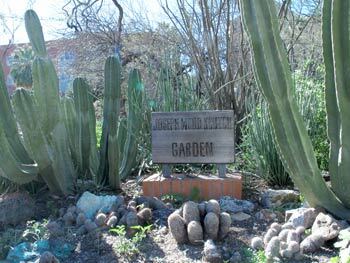 Members of the Tucson Cactus and Succulent Society helped in planting cactus and succulents in the Krutch Garden and Alumni Plaza and in accessioning the plants in the Krutch Garden. Legumes of Arizona is a project initiated by the Desert Legume Program (a joint project of the Boyce Thompson Arboretum and the University of Arizona College of Agriculture and Life Sciences). There is currently no book describing the legume family of Arizona, which is particularly important this region as many of these species are adapted to arid lands. The book will be a valuable tool for understanding this plant family and the potential uses of these plants in a variety of projects, such as landscaping, agriculture, and bio prospecting. Margaret Pope, Chair of the Sonoran Desert Florilegium Program, has been working with over 25 illustrators in Tucson, Phoenix, and Denver to produce the 94 botanical plates that will accompany descriptions of the plants. These, along with previous illustrations, some by Lucretia Breazeale Hamilton, will illustrate the approximately 151 species in the book. As the project has progressed, Margaret and the Desert Legume Program staff have organized exhibits of completed illustrations at the Boyce Thompson Arboretum and the University of Arizona.